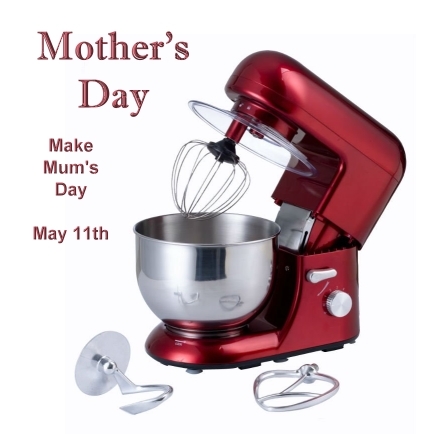 Montague had taken his kids (Maisie, Konrad and Anastasia) to the shop to get their mother a brand new cake mixer for Mother’s Day. Montague ended up not buying a cake mixer. Gwenda (Montague’s wife and mother of Maisie, Konrad and Anastasia) got breakfast in bed, a bunch of flowers and a card. Montague did most of the cooking anyway, as Gwenda wasn’t that good a cook. Gwenda thought she’d like to get better at it. You could tell she was nearly in tears. She pretended to be pleased, but she so wanted a cake mixer. “Stuff it,” said sensitive Montague. They all piled into the car (Mum, Dad and the Kids) and went off to the appliance store where they bought the biggest and best cake mixer they could bloody well find. Oops! I forgot to mention: Gwenda has no arms.